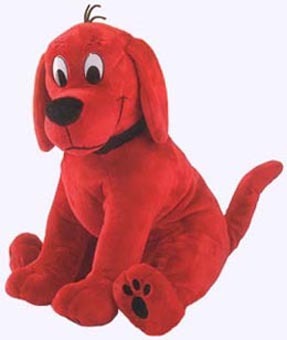 Large Standing Clifford is 15" head to back paw. Large Plump Sitting Clifford is 17" head to back paw. Medium Standing Clifford is 12" head to back paw. 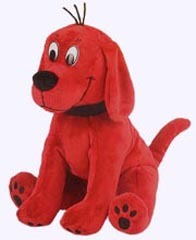 Medium Sitting Clifford is 12" head to back paw. 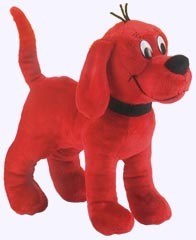 At 8" head to back paw, this standing Clifford is one any child is sure to cherish. Small Clifford sits 8" head to back paw. 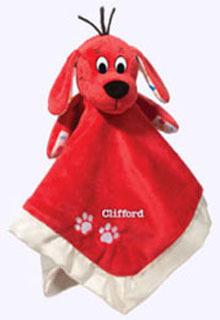 This Lil' Snuggler for baby has an endearing plush Clifford head with ultra soft fabric and embroidered details. Plush blankie is 15" x 15" and has satin trim for cuddling. 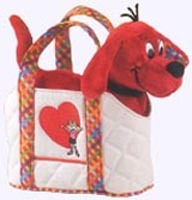 A great baby gift for the Clifford lover! Ages 0+. Machine Washable. 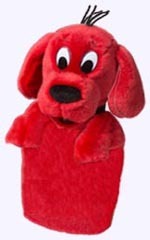 Clifford Sschlumpie is 19" long and is a great friend to ride along in a stroller or to tag along anywhere. Babies and toddlers will love this deluxe blankie pal. 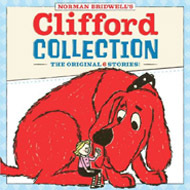 This keepsake collection includes a letter from Norman Bridwell about Clifford's historic creation as well as the original -- and never-before-seen -- painting of Clifford from 1962. You'll also discover who the real Emily Elizabeth is and see how this beloved dog has gotten even bigger over the years. 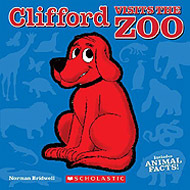 Collection includes six classic original stories; Clifford the Big Red Dog, Clifford at the Circus, Clifford Gets a Job, Clifford Takes a Trip, Clifford's Good Deeds, and Clifford's Tricks. Hardcover Picture Book. Ages 1-6. Join Clifford and Emily Elizabeth on a fantastic afternoon at the zoo! As the friends explore the zoo, they learn opposites along the way. The koalas are sleepy; Clifford is energetic. The seals are wet; Clifford is dry. Butterflies are light; Clifford is heavy. A hippo is dirty; Clifford is clean. Young readers will delight in seeing all different kinds of animals and learning opposites in the process. There is even some light nonfiction at the back of the book about each animal Clifford encounters at the zoo. 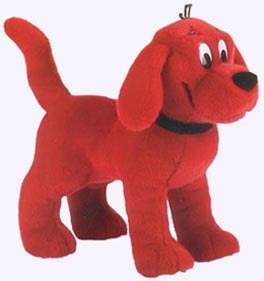 Includes a plush Clifford on the front cover! Hardcover Picture Book. Ages 1-6. 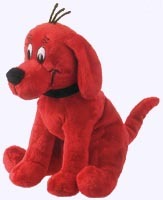 Everyone loves...Clifford, Ameica's biggest, reddest dog! The classic picture book is now available in this sturdy board book edition for the youngest child. Board Book. Ages 1 - 3. 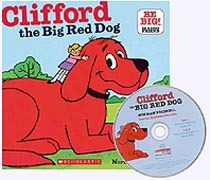 The original story of Clifford The Big Red Dog, first published in 1963, is available in this 8" paper back. Included is an audio CD with 2 tracks. One with page turn signals for reading along and one without page turn signals for uninterruped reading and listening! Book and CD comes in a portable reusable storage case! Paper Back w/CD. Ages 1 - 6. Getting Clifford the Big Red Dog ready for bed is one BIG job. First Emily Elizabeth gives Clifford a bath in the pool, then she combs his hair with a rake, and cleans his teeth with a big brush. Once the stars are shinning in the sky, Emily Elizabeth reads Clifford a betime story. Before they know it, the best friends are fast asleep. This sweet padded board book with foil on the cover will be a must have for bedtime! Padded Board Book. 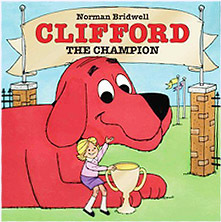 Entering a contest to become America's Super Dog, Clifford knows he will have to perform flawlessly if he is to stand a chance against his distinguished competitor, Champ, in this amusing storybook tale with bold illustrations about playing fair and good sportsmanship. Hardcover, Picture Book. Ages 1 - 6. 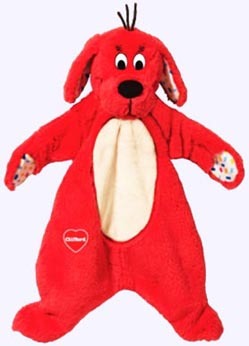 Come join Clifford for lots of school-time fun! He learns that when life gets tricky, he just needs to try his best. Direct-play DVD with 8 stories. English & Spanish. Approx. 90 min. Only 1 Available. 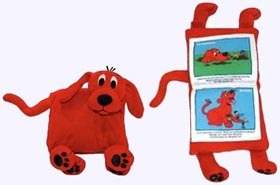 Clifford The Big Red Dog is a folded Plush Toy which opens into a cloth picture book. Each of the pages are sewn in and have a short text that encourage children to Share, Play Fair, Have Respect, Work Together, Be Responsible, Be Truthful, Be Kind, Believe in Yourself, Be a Good Friend and Help Others. 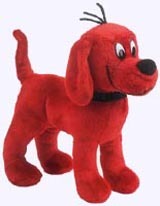 Plush Clifford has velcro closures for play time and is 9" tall and 8" wide.